I don't like shorts. Well, I guess I do. I like short shorts (they make me look taller and show off my legs), but I don't love showing that much skin to anyone except my husband. I know there are some longer options, but I'm petite as it is. Long shorts make me look short and stout - like a little teapot. As I'm sure I've said before, living in the desert is just not conducive to wearing long pants (even full length leggings) for very many months out of the year. So what's a girl to do? Capris. I wear capris all the time! I feel like capris, particularly the black legging variety I frequent, look especially like workout clothes. Whenever I see someone in capris and a t-shirt I think 'oh they're going to the gym'. Not exactly a daily option. So here are four ideas (and their corresponding Amazon links). 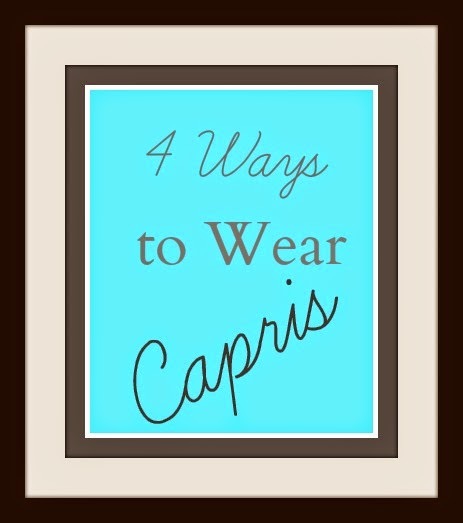 Have you tried some cool capri pants you want to share? Tell me your ideas!